TS is video stream file that is used to store videos on DVDs. It stands for Transport Stream. They can also store audio and data information. TS is a standard digital container format. It means that it can hold multiple pieces of data together in a container format. TS files can be easily converted into AVI, WMV, WMA, MP3 and MP4 files using a TS converter. This kind of file is used in broadcast systems such as Digital Video Broadcasting (DVB), ATSC and IPTV. It can compress video data using standard MEPG-2(.MPEG) video compression. TS files save themselves as multiple files on the DVD. They are played back by various software DVD players and video editing tools. Android StageFright in Gingerbread and earlier versions did not support .ts file (transport stream) playback. It only supports MP4, 3GP and MP3 file formats. A standard called HTTP Live Streaming that can support playback of .ts files. Android 3.0 supports this protocol to an extent, meaning that you can pass the URL of the .ts playlist to the Media Player and the player should be able to stream it over HTTP. StageFright comes bundled with Android 3.0. Another method for playing .ts files in Android is by using the NDK based project. Dolphine player is the best open source player for Android. It supports various video formats. You get the .ts link from the m3u file and then fetch the binary data from the .ts file. You store this binary data in a file and play the file using the video player. On Android, the easiest way to play .m3u8 files is to use an app like ‘File Explorer’ to spawn your Media Players and see which one will work. Both VLC and BS Player can be opened using File Xplorer and will play the .m3u8 file. However, you might want to edit it first to choose the best stream. Another way to deal with .m3u8 is to convert them. When it’s the ‘main’ .m3u8 or the second one (if there is a second one, you would likely want it to be local, so download that also), we find that the “Media Converter’ will read the file and convert it to something that ‘BS Player’ can play. Android Video Player apps offer some of the best features for plug and play of video and do not need an additional codec. These video player apps support most of the video formats. There are also some useful Android apps that let you download and listen to MP3 songs without eating too much of your data plan. Most of these are capable of automatically detecting the most appropriate format to play the desired video. No matter that the proper file is separate or integrated with the movie format; these movie apps are capable of reading and displaying it. You don't need to look for the video on your device or microSD card as these apps will automatically crawl & index all movies from your device and display them using thumbnails. TS files are primarily encoded multimedia files. 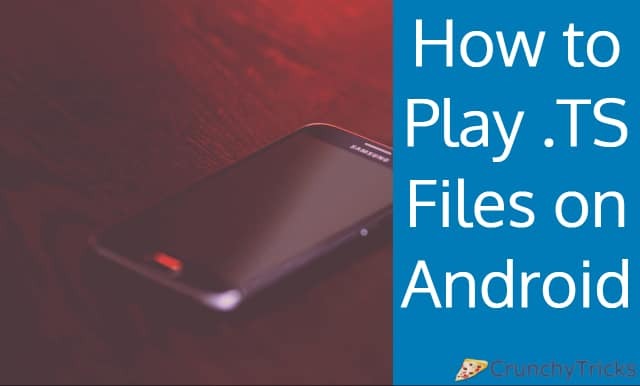 The lack of synchronization happens because the phone itself isn’t powerful enough to properly decode the file for playing. Most players can play TS files, but most of them require Android 2.3 or higher. What I mean is that no matter the player you use, the phone needs to have enough power – at least 1 GHz processor to play these files. You must check the firmware upgrade available to your phone and then try to play your file if it isn’t running. Also, you can convert the file to a standard format like MPG or AVI. The process might reduce the quality and size of the data, but the compatibility of the archive with players will increase. One app that can allow easy running of .ts files is VitalPlayer. It allows and supports almost all video and audio codecs. This powerful software will provide a smooth quality to the video. It has system play modes – SMI, SRT, SUB support, brightness control, resume play previously, various font sizes, colors and types, screen capture, screen lock, streaming and lots more. The FFmpeg LGPL is used for VitalPlayer. TS files are nowadays spread on the Internet as recordings of HDTV broadcasts. There are a variety of methods to plays such files, or we can convert them to more compliant formats for authoring as DVD. You can download and install VLC media player for Android to easily playback your .ts files. If you have high definition video content in your .ts format then there are some reasons that might cause problems in your file viewing. One reported issue is High-Quality Audio Resampling. You can change these in Settings. This issue can cause playback problems in particularly older hardware and with disabling the setting; it should take up less processing power. You can convert your .ts files using HDTVto MPEG2 so that you can have standard MPEG2 files. It can help greatly help with both playback and support from video editing software. It means that one can, depending on the resolution of the data, directly author HD DVD compilations in the circumstances.